SEO images Optimizer pro Plugin is one important aspect of overall Search engine optimization. There are many things to take into consideration for your website to make it more SEO friendly and to rank higher in search engines. Many Site owners may not realize this, but images can generate the traffic from image-based search engines (Google Images for example). If your images do not have ALT and TITLE already set, SEO image Optimizer prowill add them according the pattern you set.you can ALT and TITLE tag set for Woo commerce product image and also set for featured images of post and pages. ALT attribute is important part of search engine optimization And the best thing about images, is that they can be used to bring in organic traffic via search engine image results. When optimizing images for the web, your goal is to reduce the file size to boost your site speed.SEO image Optimizer pro build the new Optimizer images with reduce site which is plays an important role in your overall SEO. Now main Question is… How this plugin will add Alt and Title tag to WordPress images… How to reduce and make SEO Friendly Images. 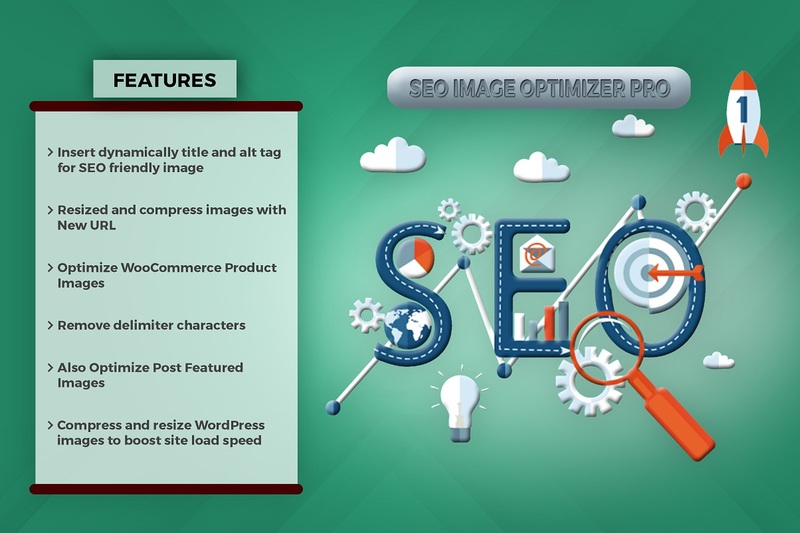 But Our SEO images Optimizer Pro is one useful WordPress image SEO plugin, which quickly adds ALT and Title tag to your images and resize and compress your all WordPress images. You can visit documentation link of plugin SEO images Optimizer Pro documentation. In this article we will discuss the main featured and key points of SEO images Optimizer Pro plugin. There are many useful featured will be added with pro plugin. Which is make your site seo friendly and It describes your images to search engine and when a user searches for a certain image this is a key determining factor for a match. SEO Image Optimizer pro plugin coming with some extra and useful featured for them who wants to dynamically insert SEO friendly title and alt tag in images. It’s also Resize and Compress the images to boost your site speed. Also Resized the old images and create new URL. IMPORTANT: If you found a bug in SEO images Optimizer Pro plugin or have any problem/question concerning the plugin, please post your query into SEO images Optimizer Pro Support Forum here in our Forum. If you do not find a solution here, do not hesitate to contact us at lizarweb (at) gmail (dot) com.